Chachapoyas, a remote province in Northern Peru, is known for its gorgeous tropical nature and ancient archaeological sites. 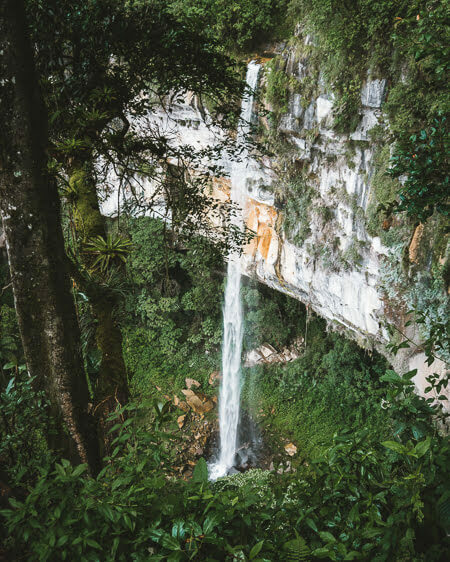 This region offers a closer look at some of the tallest waterfalls in the world: Yumbilla Falls and Gocta Falls that are nestled deep inside the Amazonas rainforest jungle. 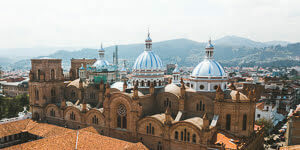 Along with breathtaking hikes that lead through jaw-dropping valleys and tropical cloud forests, North Peru is also a place of majestic ruins and historical Chachapoyas settlements. Visitors can hike to see mummy statues placed high up in cliffs or take an air tram up to Kuélap ruins, the “Macchu Picchu” of Northern Peru. 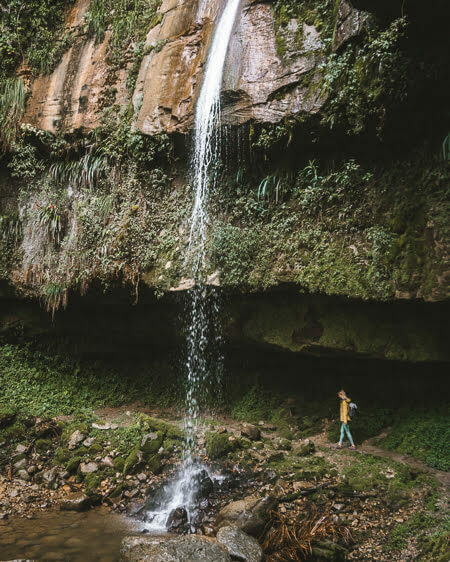 Our travel guide covers all the best places to visit in Peru’s Chachapoyas district, tips on how to get there, cost, where to stay and more! Yumbilla waterfall could easily be labeled as one of the tallest waterfalls in the world that nobody has heard of. Located on the outskirts of a small Peruvian village in the Amazonas region, this towering waterfall claims a spot as the 5th tallest waterfall in the world (although depending on who you talk to, they may call it the 3rd tallest – a dispute that has been argued over for years). 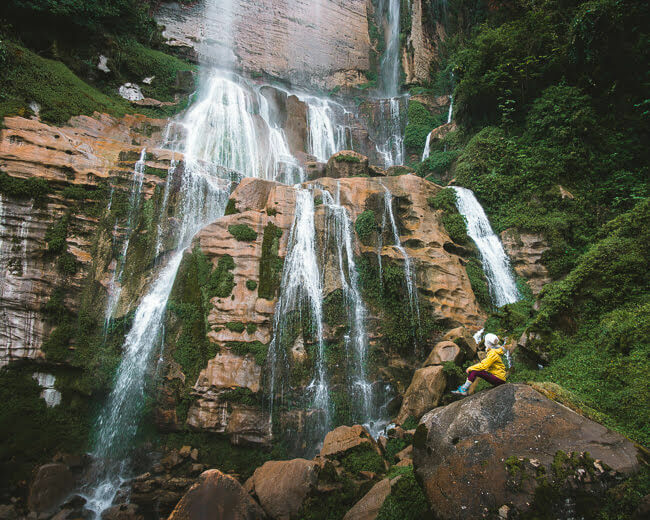 If you’ve decided to venture into this region of Peru, a visit to the Yumbilla waterfall is a must! 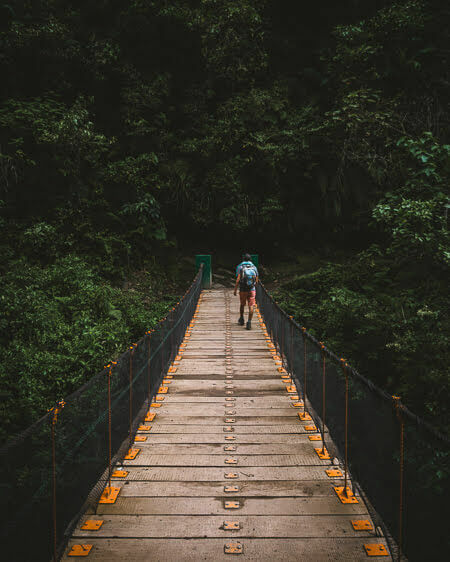 Leading through a lush jungle terrain surrounded by permanent cloud forests, this hike was one of the most spectacular things that we did in the Chachapoyas province. The trailhead to hike the Yumbilla waterfall starts outside of a little town called Cuispes. 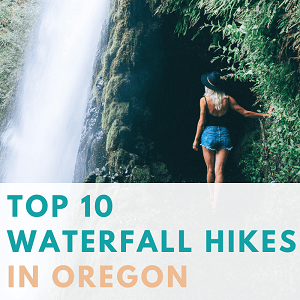 If you’re planning on hiking the Yumbilla waterfall, Cuispes is the best place to stay and arrange the hiking permits before heading out on the trail. A note to backpackers: you will first need to take a bus to a city called Pedro Ruiz Gallo. From there you can hop on a Tuk Tuk (a small motorcar) up to Cuispes for around 10 soles (around $3 USD). We travel in a campervan so we were able to drive up to Cuispes ourselves. The roads got pretty narrow and steep but good enough to make it up there in one piece. Once you get to Cuispes you will need to arrange a hiking permit at the tourism office. The town is very small and any local can point you in the right direction. The permit office closes at around 1:30 pm but after that you can get the hiking permit from the hostel across the street. The permit to hike the Yumbilla waterfall costs only 10 soles ($3 USD) per person. All the money from the collections goes back to the upkeep of the waterfall and to the local community (which I thought was really awesome). The local community efforts and the remote location of the Yumbilla waterfall seem to keep the trails very clean and eliminates the “casual weekend hikers” that often go to places to party and drink. The trailhead to the Yumbilla waterfall is located an hour walk from Cuispes. If you don’t feel like walking this extra hour, you can also arrange a Tuk-Tuk cab to take you up there for 5 soles (around $2 USD). Depending on your cab driver, he may even stick around and wait for you until you’re done with the hike. The Yumbilla hike takes a few hours to complete and leads through a narrow jungle path occasionally offering glimpses of panoramic views in between the trees. We started the hike at around 9 am in hopes to avoid the rainfall, but we quickly realized that it’s an impossible aspiration in this region. It was pouring on us the whole time! After hiking for about 10 minutes we reached the first viewpoint of this trail of the surrounding mountains and valleys. Wrapped in cotton candy-like clouds, this was my favorite lookout point of the trail! 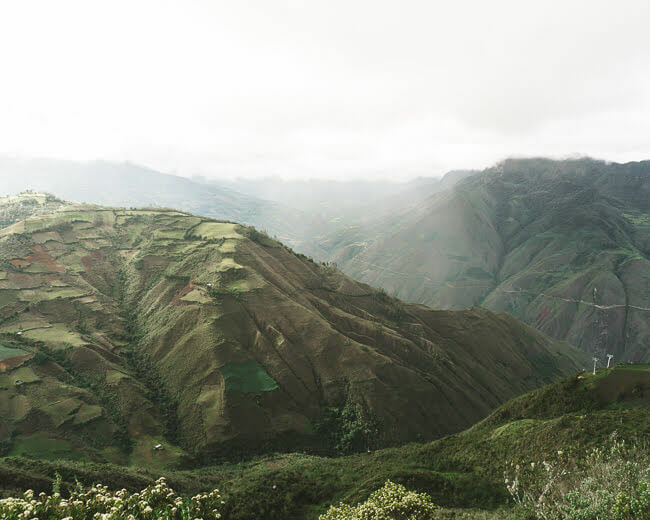 The high altitude mixed with a rainy climate creates a permanent tropical cloud forest in this region. It gave this hike a mysterious feeling, nothing like we’ve experienced before. During the hike, we passed a few smaller waterfalls including Medio Cerro Falls where we saw a group of local visitors canyoning down the waterfall. 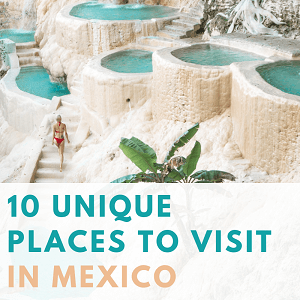 For around 100 soles ($30 USD) guides can be arranged in Cuispes that will take visitors canyoning through a few different waterfalls and rivers along this trail. The trail continued on and soon after we passed another waterfall, the Cristal Falls with a pretty little bridge leading across a narrow river. About an hour into the hike we finally reached a viewing platform of the Yumbilla falls in the distance, but overall the view was pretty obstructed by overgrown trees. There were no clear signs from there indicating which way to go, but we made our way slipping and sliding through a narrow path until we reached a suspension bridge. For the lack of signs, we almost turned around, but we continued on until we reached the base of the Yumbilla waterfall where we could finally take in a full view of its grand beauty. Another wonderful day hike in that same area is the Pabellon waterfall. The Pabellon Falls hike starts at the same trailhead as the Yubmilla hike, just heading into the opposite direction. Once you head into the Pabellon trail, a few minutes in there will be a turnoff to the right crossing a small river. Look out for a blue “Pabellon” sign – we missed it the first time around. The trail from there will get super muddy and cross through a “mini” swamp. We continued on through the jungle and even had to crouch super low to crawl through some overgrown bushes. 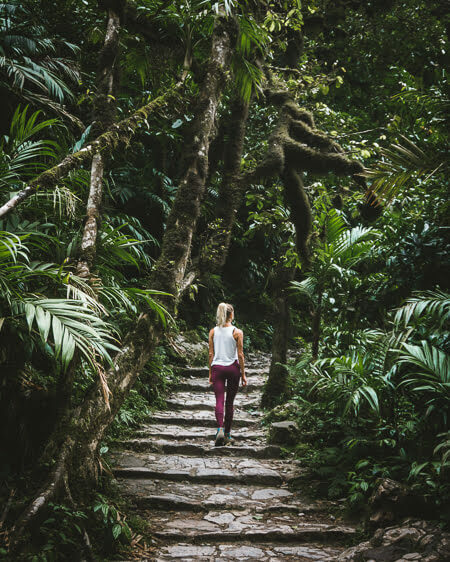 The Pabellon trail is more challenging than the Yumbilla hike, but a lot more satisfying once you reach the waterfall since it requires a lot more effort! After a 30 minute adventure through the thick jungle terrain, we finally made our way to the Pabellon waterfall. We scrambled around the rocks to get a closer look but the waterfall mist was too strong so soon after we headed back. The weather in the Amazonas jungle region can be very rainy and unpredictable. When we started the Yumbilla hike the skies were clear and blue but a few minutes later it was pouring on us. We had to run back to our car to grab our rain jackets and change our shoes. 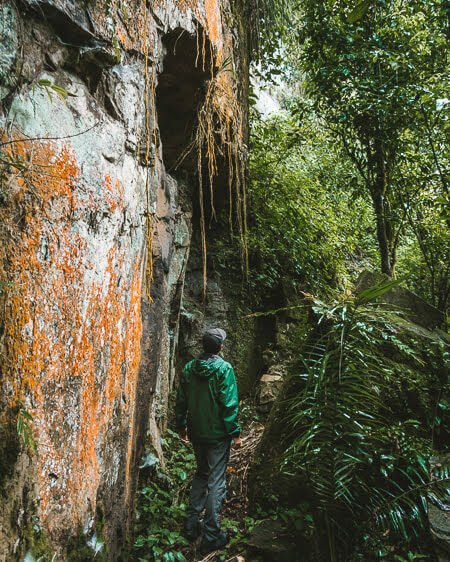 While hiking in the Chachapoyas region it’s best to prepare for heavy rain than to be surprised and stuck on a few hour hike with no rainproof clothing. The climate in this area is very hot, but a rain jacket and waterproof hiking shoes are a must to tackle the muddy and slippery trails. In some sections of the hike, my foot would get completely submerged under mud. For these type of muddy hikes I recommend wearing high top hiking boots like these Vasque ones. The Yumbilla trail is a few hours long so bring enough snacks and water to set you over. The closest town to the Yumbilla trail is Cuispes. It’s a small town where puppies and chickens run wild on the streets, far from being glorious but has a cozy welcoming vibe. Cuispes only has one main hostel – La Posada de Cuispes. It’s a lovely and cozy family run hostel and surprisingly well maintained for being in such a small town. The owner Javier takes excellent care of his guests and can help arrange tours to the nearby waterfalls. 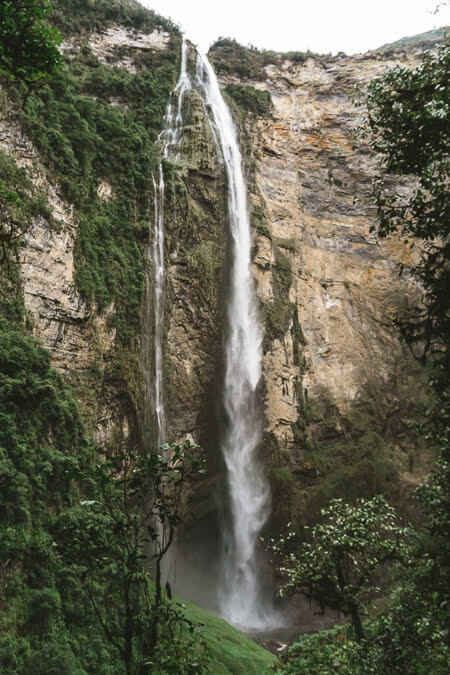 Another stunning waterfall hike in the Chachapoyas region is the Gocta waterfall, the 16th largest waterfall in the world. Ironically the Gocta waterfall is smaller in size than the Yumbilla waterfall, but more frequently visited. 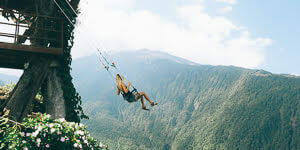 The town Cocachimba where Gocta waterfall is located has been more developed for tourism with better road access, more hotel options and places to eat. Similar to Yumbilla waterfall, Gocta was not well known until 2002 when a German explorer claimed it as the 3rd tallest waterfall in the world. Although that fact is not true (Gocta ranks as the 16th tallest), the town’s tourism picked up quite a bit. All of a sudden international tourists started traveling to Chachapoyas to see this giant waterfall. As a result more hotels and other amenities were built to support the incoming visitors. The trailhead to hike Gocta Falls starts in Cocachimba. The Gocta waterfall can be spotted from the town but a trail can he hiked that leads up to the base of it. The cost to hike the Gocta waterfall is 10 soles (around $3 USD) per person. Hiking permits can be purchased in Cocachimba at the ticket office and will be collected upon entering the trail. Cocachimba is another small Peruvian town that evolves around tourism so it’s pretty easy to navigate it once you get there. The hike to the Gocta waterfall is moderate in difficulty and goes up and down hills quite a bit. 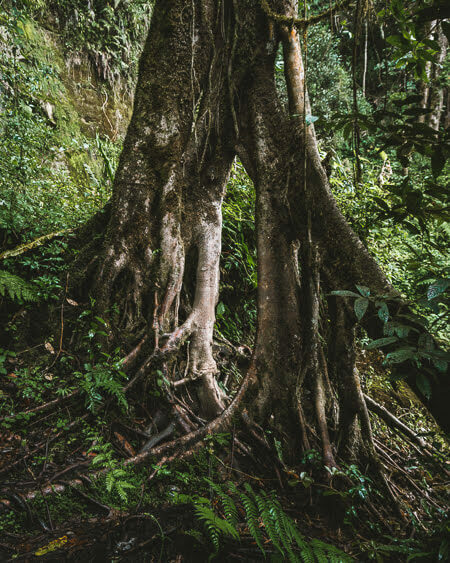 Contrast to the Yumbilla hike that leads through a tiny trail in the jungle, most of the Gocta trail is wide and heavily used by hikers and horseback riding tours. After hiking for 2 hours through the rainforest jungle we reached a sneak peek of the Gocta waterfall from the distance. We continued on and soon after made it to the base of the waterfall. 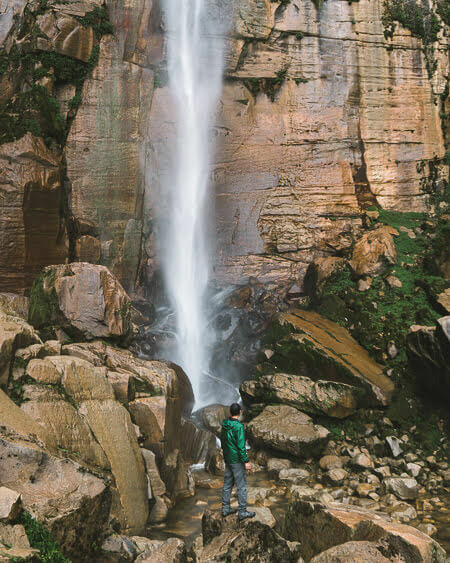 Hikers can go all the way up to the Gocta waterfall, but will get soaked by the rushing water mist! After spending some time enjoying the pretty scenery we slowly started heading back to the town. We were passed by a few horseback riding tours on the way and I’m not gonna lie, I was a bit envious of their sweet ride back. It’s not that the hike was super challenging, but without many views along the way, the time just seemed to pass a lot slower on the way back. If you’re interested, horseback riding tours can be arranged from Cocachimba and cost 30 soles ($10 USD) each way. In total the hike took us around 4 hours but seeing the Gocta waterfall up close was totally worth the extra effort. What I learned about the Amazonas region is that as long as you bring a rain jacket and waterproof hiking boots, you don’t need much else. The hike is 4 hours long so you might want to pack along extra water and food. If you’re looking to treat yo-self, hands down the best place to stay in town is the Gotca Andes Lodge. This is a luxury hotel with beautiful and spacious rooms overlooking the Gocta waterfall in the distance. The lodge also has a beautiful infinity pool with a view of the waterfall wrapped in a cloud forest. Unfortunately the lodge only offers 10 rooms and often gets sold out months in advance. The Sarcophagi Of Karajia (or Carajía) is an archeological site with 7 statues placed on top of a cliff. 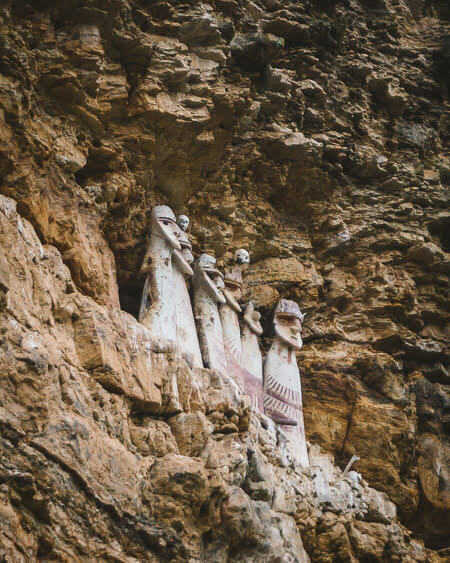 Built in the 15th century, these statues represent ancient wise men from the Chachapoyas region. The Karajia sarcophagi, made of clay and sticks, hold mummies inside and have skulls placed on top of them. There used to be an 8th statue but a while back an earthquake toppled and destroyed one of them. The trail to hike the Karajia sarcophagi starts in a small community near Luya. It’s one of the smallest communities we have visited in this region and took us a few slow hours to drive there from the main highway PE-08C. The Karajia site doesn’t offer much for visitors except a few homy restaurants, but all the locals were super friendly and welcoming to us. The town has an office where visitors can pay 5 soles ($2 USD) to hike to the Carajía statues. The trail that leads to Sarcophagi Of Karajia is only 30 minutes long and mostly goes downhill. It passes potato farms along the way and ends at a cliff where the mummies are displayed. The sculptures are located high up on the hill preventing looters from destroying them. It’s not a very popular tourist attraction so there are no guards watching over the site and the distant placement of the mummies is one of the reasons why they are still intact. Unfortunately that also means that the Carajía statues can only be seen from very far away. We walked around trying to get different vantage points, but we couldn’t get very close up. To get a closer look at the statues I highly recommend to bring along binoculars or a zoom camera lens. The mummy statues were super far away and we had trouble getting pictures with our standard camera lens. The closest hotels are located in the town of Lamud, around 30-minute drive from Karajia site. Hostal Monte De Nubes is the go-to hostel in this area. If you’re looking for more of a cozy and quiet atmosphere, check out the Tambo Sapalachan Lodge. The Kuélap ruins (or Cuélap) are a walled settlement in Northern Peru high up on a mountain with a view of the Utcumamba valley below. The stunning location of this site often earns it the nickname as the “Macchu Picchu” of the North. 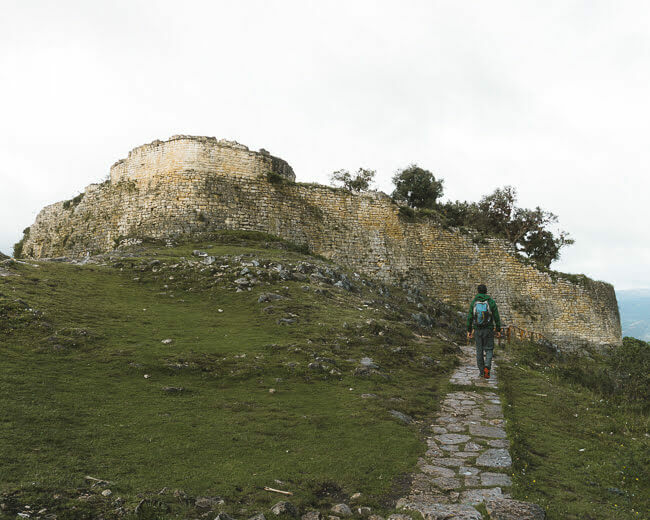 The site was originally built by a pre-Inca community “Chachapoyas” around 500 AD but was taken over and ruled by the Incas. The site was abandoned in 1570 due to the Spanish conquest in Peru. The Kuélap ruins were rediscovered in 1843 and have been slowly excavated since then. During our visit there was still a lot of maintenance going on along the main wall and different sections of the ruins. 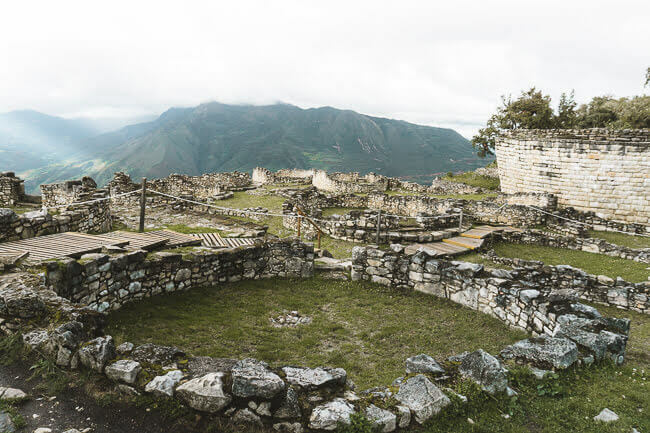 This archeological site is considered as one of the biggest discoveries of the Chachapoya culture however the remote location makes it difficult to access these ruins. During our visit, we couldn’t believe it but we were the only people at this location. The best way to get to Kuélap Ruins is by a cable car located near town Nuevo Tingo. The cable car costs 20 soles (around $7 USD) and will take you for a ride of a life time through jaw dropping mountains. If you’re backpacking, you can arrange a bus from Nuevo Tingo to take you to the cable car. If you travel in your own car, there are some spaces to park next to the cable car starting point. It’s possible to drive all the way up to the Kuélap ruins, but it’s a bumpy 2 hour drive through narrow roads with thousands of feet drop off below. We ended up doing this drive but it was really stressful and I would not recommend to do it. Some of our friends traveling in RV’s had to turn around and head back because the roads were not passable for them. The entrance to Kuélap Archelogical site is 20 soles ($7 USD) and starts at the Kuélap visitor center. From the visitor center a 30 minute path leads to the entrance of the Kuélap archeological site. The ruins are surrounded by a solid stone defense wall with narrow funnel-type of entrances that only permit entry of one person at a time. It’s believed to be an ancient strategy to prevent the site from being taken over. From the entrance, a looped trail leads through the Kuélap ruins and takes about an hour to complete. It kicks off at the highest point of the ruins, in a section devoted to rituals and offerings. In the ancient cultures it was believed that the higher something was built, the closer it would be to the Gods. The path continues on through the residential sections of the settlement that are shaped like round huts. These houses were used for sleeping, breeding guinea pigs, and burying the remains of the dead. In the Chachapoyas culture, it was a common practice to bury the bones of the dead in the homes of the family members. 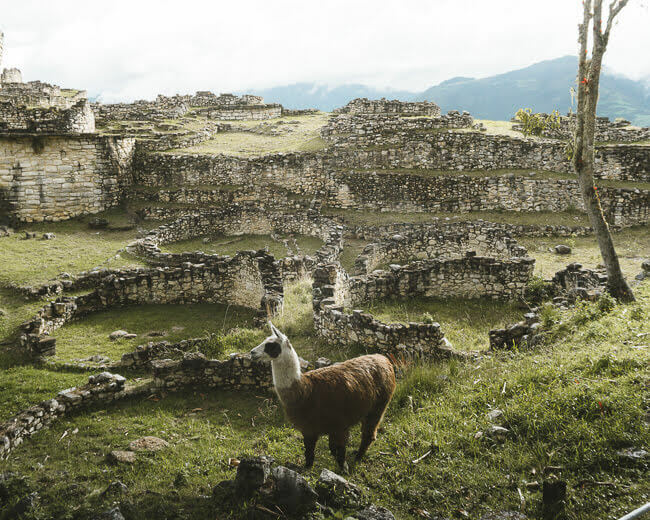 In a similar practice to Macchu Picchu, the Peruvian Department Of Culture placed a few llamas at the site as a tourist attraction. Although llamas do not originate in high altitude locations, in Peru they are often brought in and farmed as an extra food source along with guinea pigs. You’ll be doing a lot of walking around the ruins so make sure to wear good walking shoes. 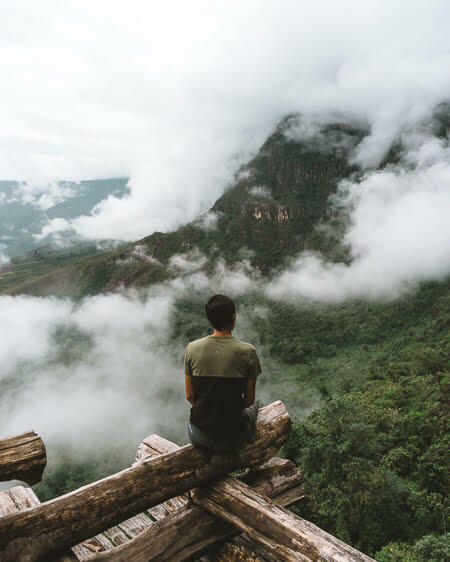 During our time in the Chachapoyas region, it was raining almost every day and our visit to Kuélap ruins was no different. Bring along a rain jacket and you’ll be all set. The closest town to Kuélap ruins is Nuevo Tingo that offers more of a variety for hotel accommodations than the other little towns in the Chachapoyas region. 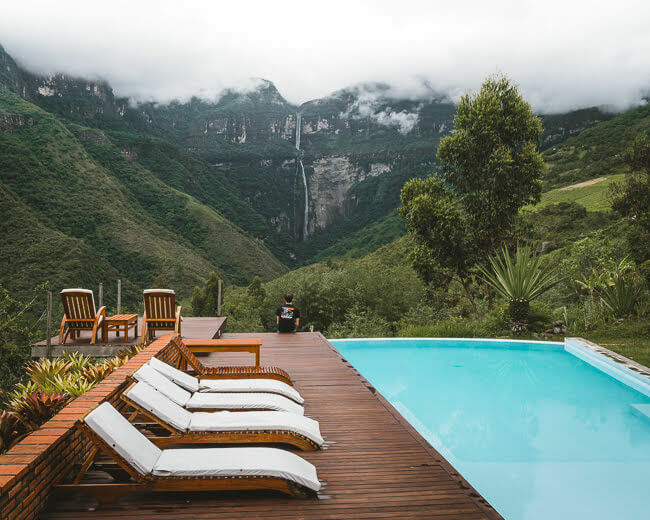 For a cool local experience check out Ekokuelap Hospedaje Ecológico, a hotel that offers cozy round eco-lodges built in the traditional Chachapoya style. Make sure to book these bungalows early – there are only 3 of them and they sell out quickly! 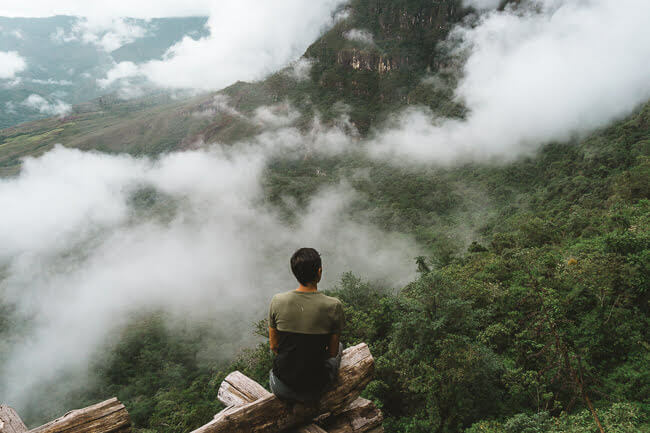 Here’s a few tips and things to keep in mind about traveling through the Chachapoyas province Peru. The currency used in Peru is the Peruvian Sol. At the current exchange rate, $1 USD will get you around 3 Soles. When looking at prices, just divide everything by 3 to convert to the USD. Overall, the Chachapoyas province is one of the cheapest areas we have visited in South America. The remote location and lack of “fancy” establishments keep the prices low and crowds out of this region. The two main languages spoken in Peru are Spanish and Quechua, an indigenous language spoken in the Peruvian Andes region. Most little villages in the Chachapoyas district speak Quechua, but visitors centers typically have attendants that speak Spanish as well. If you don’t speak Spanish, this would be a good time to freshen up on some basic phrases to help you get around. The weather in the Amazonas region is hot, rainy and humid. 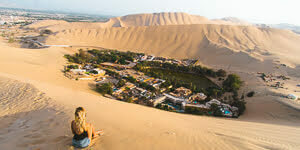 When packing for a trip through Northern Peru you’ll want to bring light clothes but also lots of rainproof clothing. We felt very safe traveling through the Chachapoyas province. Most of the little villages in this region center around farming and in our experience those are the nicest, friendliest folks. 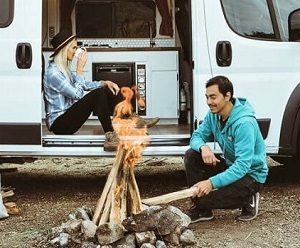 In most cases, the locals were just curious about the crazy white gringos traveling through South America in a van and wanted to know more about us and our journey.